At Tintern Grammar, we are proud to have offered the International Baccalaureate Diploma Program (IB) for over 20 years. Respected and recognised worldwide as a benchmark of academic excellence, the IB was developed to give students an optimal preparation for university and further tertiary studies. The IB Diploma is a two-year curriculum undertaken in Years 11 and 12. 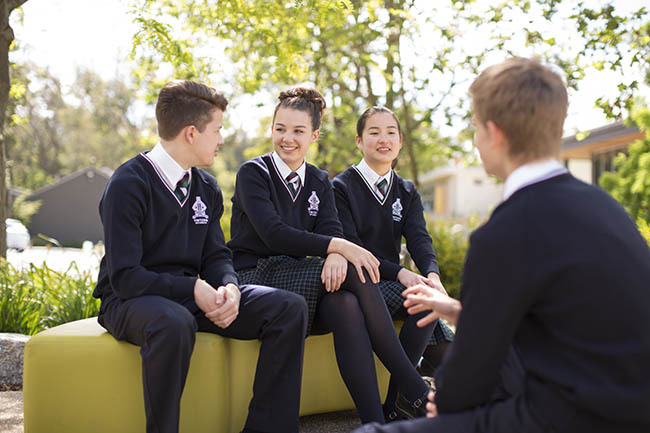 IB provides an alternative to VCE and VCE VET, focusing on independent research and essay writing, and has a distinct emphasis on educating the whole person. Strong emphasis is placed on the ideals of international understanding and responsible citizenship. The IB Diploma is recognised by all Australian tertiary institutions and major universities worldwide. Tintern is the only school in our region to offer this globally renowned study pathway. Tintern’s VCE and IB results are among the top in our region. The median IB ATAR conversion achieved by Year 12 IB students was 96.70. 21 per cent of Year 12 IB students achieved an ATAR conversion of 99 and above. 32 per cent of Year 12 IB students achieved an ATAR conversion of 98 and above. 69 per cent of Year 12 IB students achieved an ATAR conversion of 95 and above. 95 per cent of Year 12 IB students achieved an ATAR conversion of 90 and above. Seven Year 12 IB students received an IB Award for achieving an overall IB score of 40 or above.